Paris is the most beautiful city on Earth. Now I can see how that statement may be controversial, so to those who disagree, I concede the following: Paris is the most beautiful city on Earth. With that off my chest, I should also clarify that the word ‘gloomy’ here is used in the context of weather only. Paris is always alive, always upbeat. But in the winter months, it can be gray, cloudy and rainy and it can stay like that for many many days. In the absence of clear blue or partly cloudy skies, taking interesting cityscapes becomes challenging. In this essay, I discuss some of ways I tried to overcome these challenges and come up with (what I hope are) interesting shots. I started at the Place du Trocadero, which on account being directly across from the Eiffel Tower and at a slight elevation, is an obvious choice for photography. I arrived there at around sunset, with the forecast for the clouds breaking and the possibility of some color and drama. Alas, the forecast was wrong. I improvised by doing an unconventional composition that includes the tower but focuses on some of the beautiful Parisian architecture around it. I did another, slightly different take, that reminded me of travel brochures and guide book covers. Then I started walking around hoping to find interesting subjects with the tower in the background. 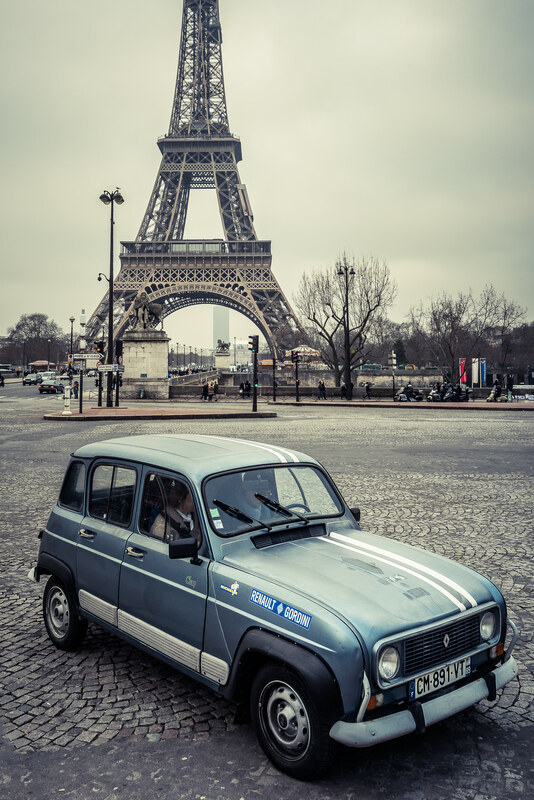 This vintage Renault seemed perfect. In processing, I experimented with split toning and playing with the tone curve to give the shot a slightly faded, aged look. The Trocadero offers sweeping views of the city. 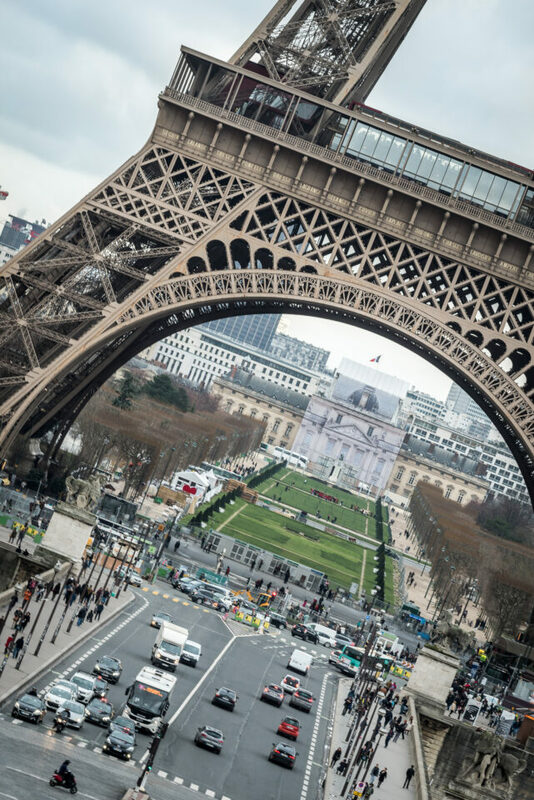 A photographer does not have to limit themselves to the Eiffel Tower. 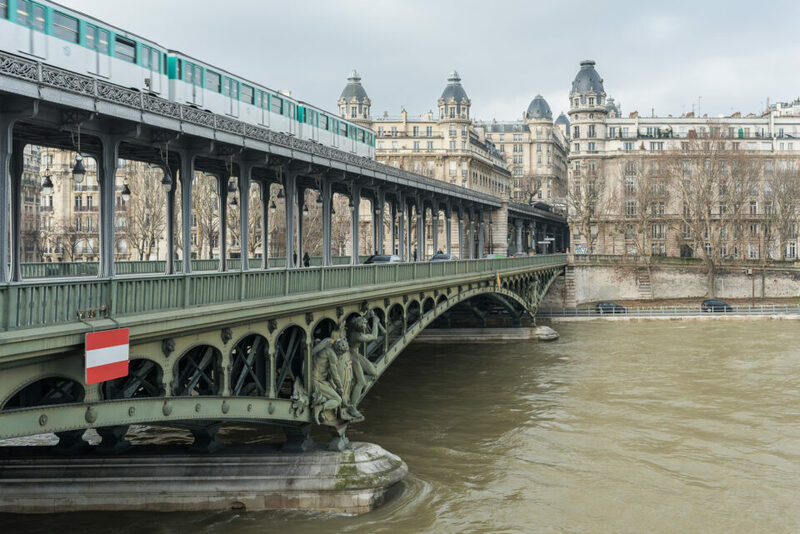 Another great way to capture interesting photos is on and around the various bridges that connect the two banks of the city separated by the river Seine. Even if cityscape opportunities are limited, there are always the streets of Paris, brimming with interesting scenes and characters. 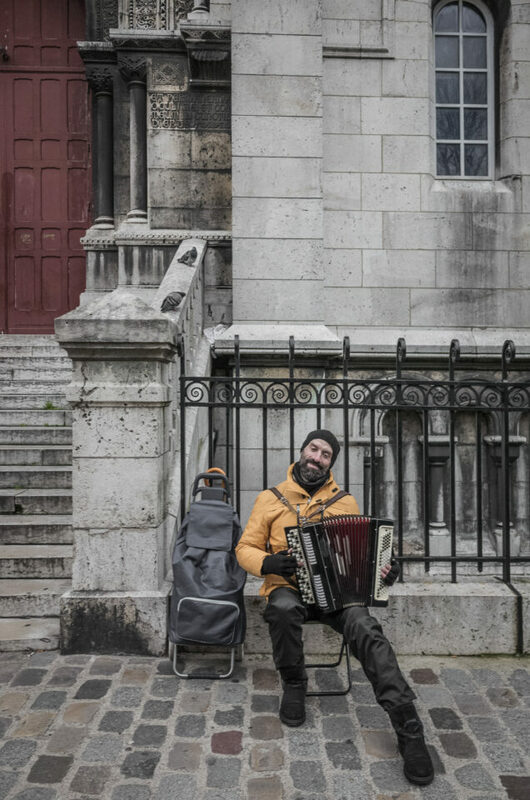 I saw this gentleman playing the Accordion behind the Sacre Coeur in Montparnasse. If nothing else, I would visit Paris just for the Patisseries. 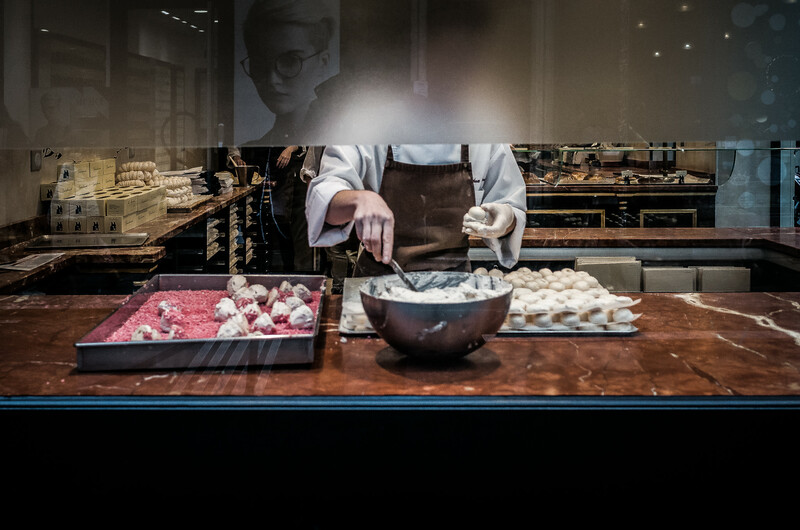 No one makes pastries and sweets like the French. 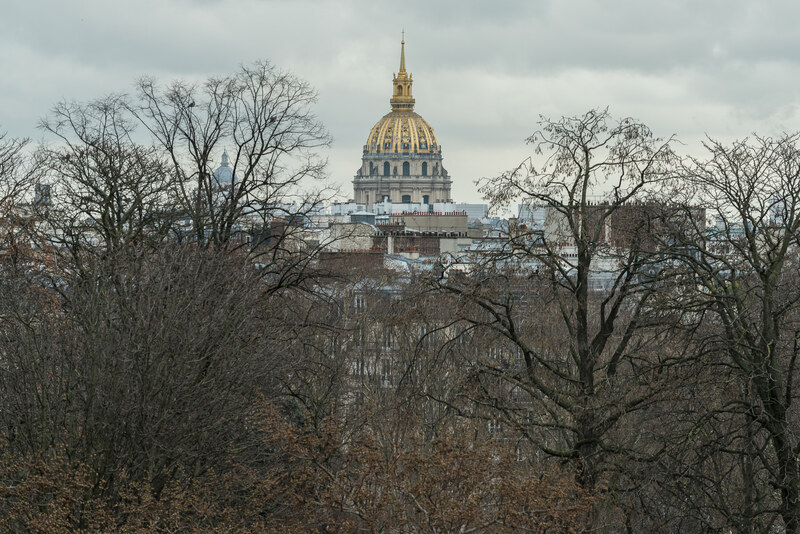 Here’s a quintessential Parisian view, taken from steps behind the Sacre Coeur. 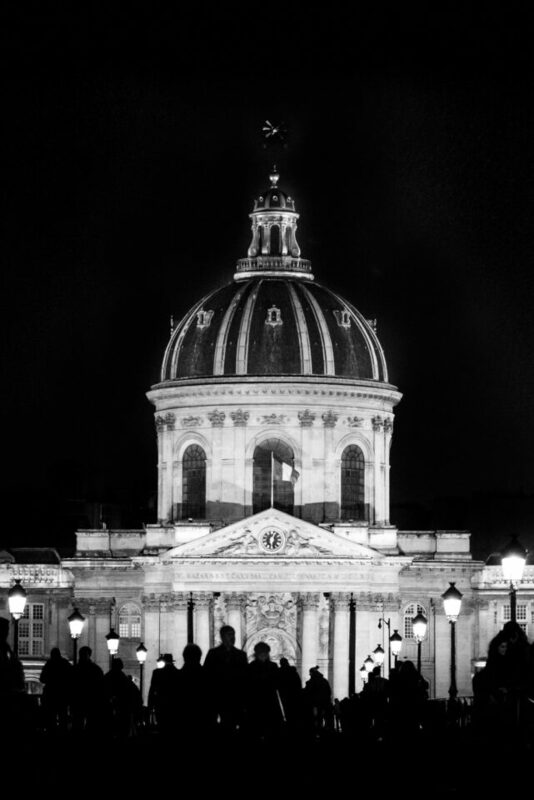 The rest of the images are from around the Latin Quarter, taken as dusk. I was able to overcome some of the gloom either by processing in B&W or waiting for the city lights to come on and add some life to the images. Here’s one of the crowds headed towards the Institut de France on the Pont des Arts. Another image from the Pont des Arts, this time of Pont Neuf (Paris’s famous skyscraper, the Montmartre is visible in the back). Same view, different perspective. This time the Notre Dame de Paris can be seen in the back. Yet another shot of Pont Neuf as seen from Pont des Artes. To conclude, I made the most of my photography in cloudy, gloomy Paris by doing unconventional compositions, looking for interesting subjects, playing with effects, incorporating street scenes and processing in B&W. I hope that this will be helpful to others who find themselves in this beautiful city (or any city for that matter) in similar, uninspiring weather conditions. Happy shooting! The Paris Gloomy Pictures!!! I absolutely love these pictures. They take me to a part of the world I have never walked on. The photos are very creative and unique. I love the different angles, the hills, the people, the Tower from a different perspective, the black and white, the tone curve to give the picture a different feel. Absolutely enjoyed the architecture! These were amazing! Thank you for sharing. Wow, really great shots. Love them all. Thanks for sharing! If you think Paris in winter is gloomy, try London. Or Stockholm, for that matter. You will do better in the future (and will have a chance to be taken marginally more seriously) if you avoid intentionally offensive titles. Article 1 of PL’s Code of Conduct states “Do not post any […] offensive […] remarks […]”, and I find your title offensive. I’ve got to respectfully disagree here. Gloomy is not exactly an offensive term, it’s just a state of being when its cold and cloudy out. All cities can be gloomy at times. I’m from Boston and we have plenty of gloomy days but that doesn’t mean there is something inherently terrible about the city. Not to mention the author follows up his statement with “Paris is the most beautiful city on Earth.” If that isn’t high praise for Paris, I don’t know what is! Are you trying to tell me I have no right to be offended by his use of the adjective “gloomy”? That’s too bad, then, because I am. And it is so obvious that “gloomy” can be meant in an offensive way that he painstakingly tries to make up for the offense in his introductory text. I hereby officially ask Nasim to take my being offended into consideration and make the author change his title on the basis of this site’s very Code of Conduct. If you are offended, that is really too bad. The word gloomy has no negative connotation in English. It simply means a day that is overcast with no sunlight available. It is you who must change your attitude and opinion. The author has every right to use that word in his title, and I for one support him, and I hope that Nasim takes YOU to task for misusing the code of conduct. I suggest you revise your English. As you will see below, “gloomy” is defined as “dismally and depressingly dark”, “melancholy”, or “lacking in promise and hopefulness”. Did you say “negative connotation”? 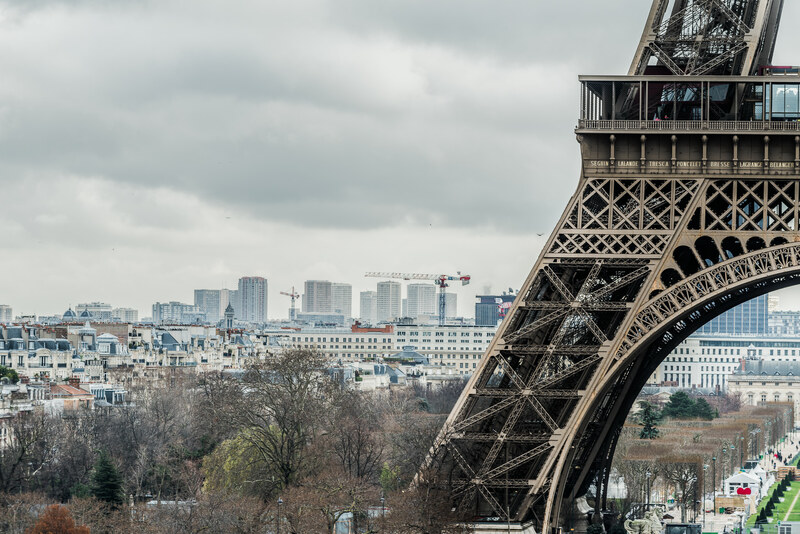 Paris is my favorite city in the world, and I may not have titled the article this way if I had written about photographing cloudy days in Paris. Nonetheless, I do not think Talha intended to cause any offense with choosing the title he did. And regardless, thank you for your feedback for Photography Life. I love Paris and Parisians. Greatest city on Earth. I also began the article with ‘Paris is the most beautiful city on Earth …’ which got edited to ‘gloomy’. Point was, I think Paris is the most beautiful city and if you disagree .. well I’m not budging. All in jest of course :). Here in SoCal we use gloomy almost always in terms of weather .. apologies for the misunderstanding. Vive la Paris. Vive la France. Nasim and I were wondering about that. Dominique – this whole thing stems from a misunderstanding. Talha’s first sentence originally read “Paris is the most beautiful city in the world,” not “most gloomy.” We were confused while editing it about what Talha meant, and changed it to say gloomy. So, it was simply an error and not anything malicious. I have changed back the article to how it was originally sent to us. Thanks everyone! Seems you have too much time on your hands. Nothing wrong with the title. Well, I find your gloomy complaint offensive. How about that? Free speech includes the right to say things that others might find offensive. To be offended by a perfectly normal English adjective is really pushing the limits of self-righteous pomposity and demonstrates the nonsensical levels of political correctness that we have come to. If you are offended, too bad. You don’t have the right to censor another’s words just because you don’t like them. That’s what happens in a police state. Well, I love Austin and this week it is definitely gloomy weatherwise which made this article nice because I would like to go shooting photos tomorrow. Thanks. A friend from LA moved to your area recently and loves it. Good luck with the photos. I was hoping Dominique’s comments were in jest. Apparently not. Sad. 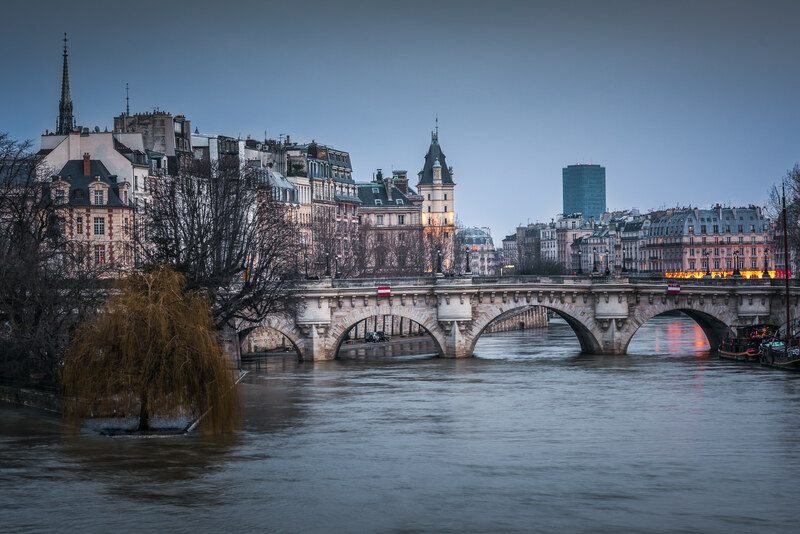 I can’t see why a photographer could not say “gloomy Paris”, if that is the atmosphere the weather conditions lend to the city when he was there. I for one find it an interesting theme. The images are quite good. I might have gone for a bit more underexposure (digital tends too make everything brighter than it looks to the eye), and would have straightened some horizontals and verticals. But, thanks for sharing! Thanks Michiel and I appreciate the feedback. Lovely – thank you. Paris may be gloomy, but it sure is photogenic! LOL, great article and advice, though a little late. I just got back from gloomy Paris a couple weeks ago and this would certainly have helped me out. I suspect this advice however, will work for other gloomy cities, and I have no doubt I’ll find myself in one of them sooner or later. Thanks for the tips. Wow!, Some really stunning photographs. Unfortunately, my images of Paris were not quite as dramatic even on sunny days. Maybe next time. 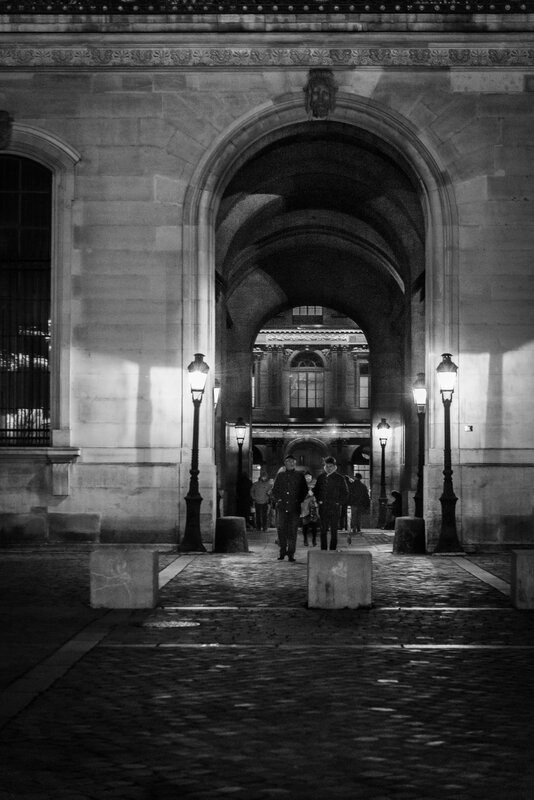 Very nice photos of Paris, thank you. I just returned from a very gloomy trip to the coast of Washington and even gloomier visit to the Oregon coast where driving with wipers on high speed was like driving through a car wash. So I have a much greater appreciation of those who take photographs in gloomy weather. Haha. Hope some of that moisture can make it’s way down to SoCal, we can always use some .. I really love some of your photos, and yes, during winter there is time when you don’t see the sky for days. NB: also, the tower in the background is Jussieu (the university) not Montparnasse. Thanks and good catch, it is Jussieu. I would love to see all of these images in b&w which would have imparted or conveyed that “gloomy” appeal. I love Paris and London, but they are second to my hometown of Washington, DC! Nice article ! Thanks. Just a little mistake : Sacre Coeur is not in Montparnasse but in Montmartre ! Yes, thanks. I realized that as soon as someone pointed out my other Montparnasse mistake. 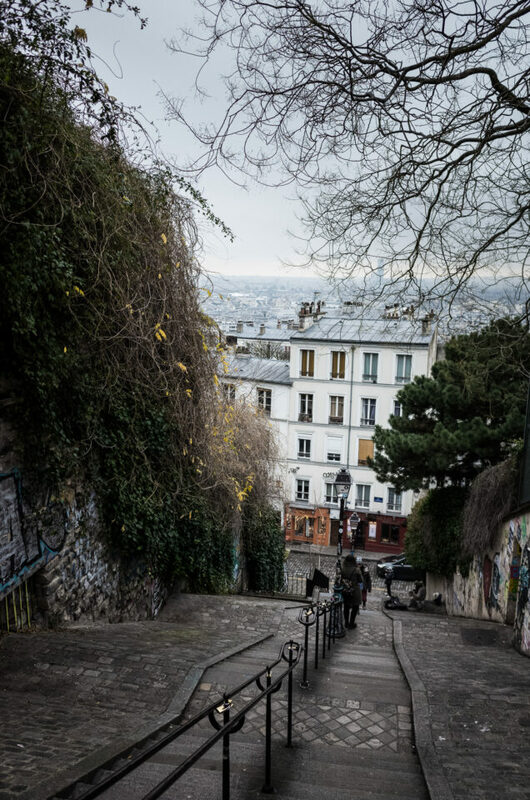 Don’t want to misinform readers but it is true, whether it is Montmartre or Montparnasse, you get stunning views of Paris. You have now made the opening two sentences make no sense. It is good thing to be diplomatic and try to make everybody happy, but not at the expense of truth, honesty or common sense. And it is never good policy to give in to trolls. It only encourages them and makes them worse. Elaine, it’s my bad. That’s how I wrote it. Was trying to convey my love for Paris but backfired. And troll or no troll, the original opening (Paris is the most gloomy city) was kind of off-putting. Anyway, I think most people got what I was trying to say and we all got to look at some photos so no harm / no foul. It shows the limitations of relying on a dictionary. An English speaker knows better than a dictionary just what a ‘gloomy’ city is. And yes, it is a description of nearly any European city in winter and not an insult. 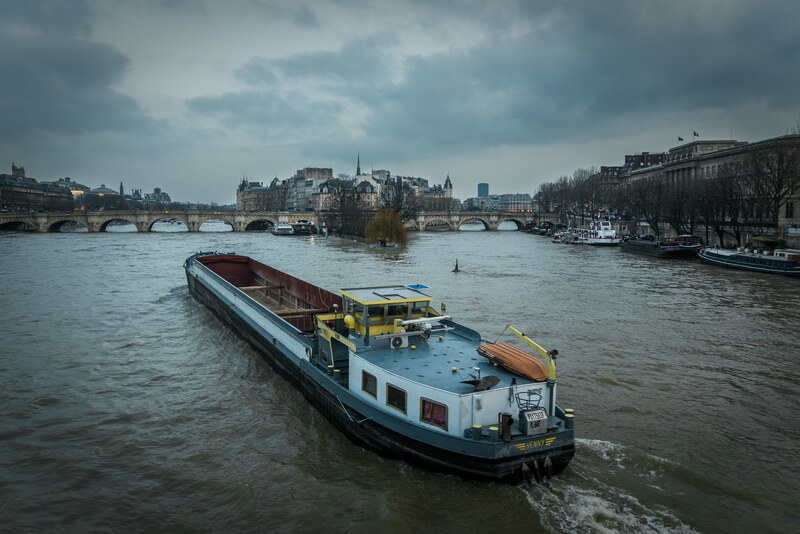 As a Parisian, I have to agree : Paris is gloomy in winter ! I used to live there – used a Roleiflex 6×6 in those days. Marvelous and unique city and some of your pictures capture it very nicely. Thx for sharing. 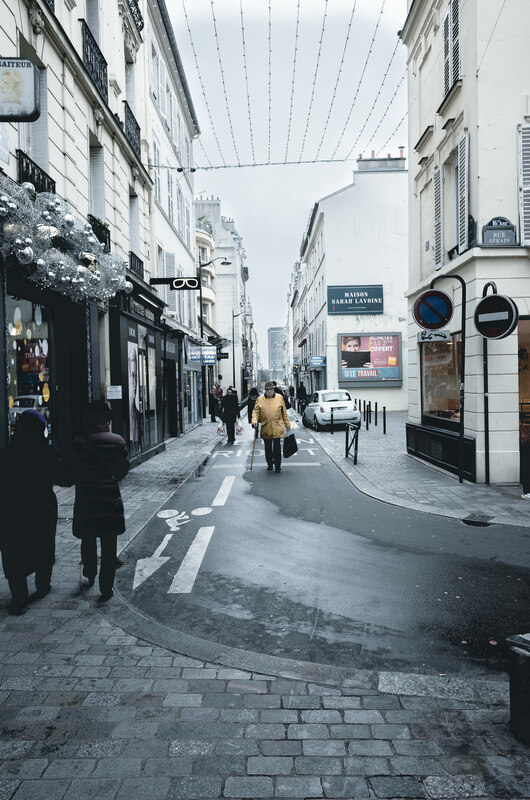 And yes, Paris can be gloomy in the dark months – in French “maussade” or “tristounet” come to mind. But not at heart. 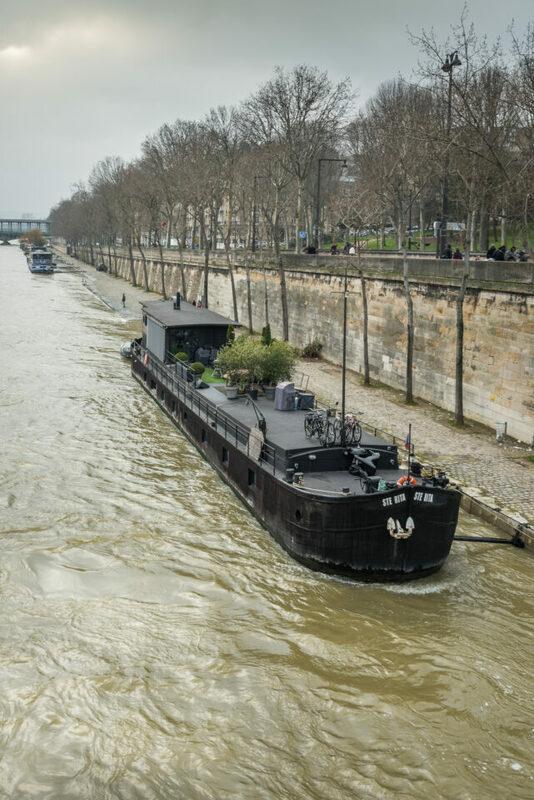 And then, of course, comes springtime in Paris…..